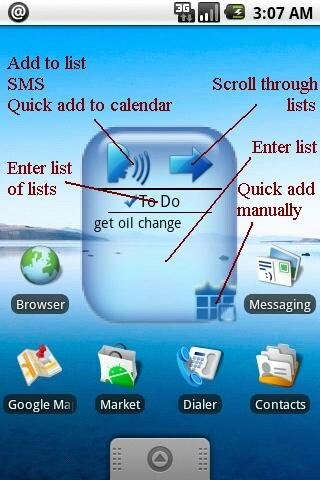 QwikList Voice: This is a handy home screen app that allows you add items to a list, send SMS, or quick add to Google Calendar by speaking to your phone! Uses Google voice to text. You can quickly and easily create reminders, shopping lists, to do lists, task lists with speech. Supports adding item to list via barcode scan. One of the only Android apps that allows easy quick add to Google Calendar in widget form. Available via the Android Market here or at OnlyAndroid here. 2x2 and 1x1 widgets available. You can change the background color of the widget in preferences. Supports Google Apps accounts for Calendar Quick Add. Feedback is absolutely welcome! Post ideas, feature requests, annoyances, etc etc at the app Google Groups page. Anyone with devices other than the Droid, please also let me know about performance. This apps is supported on devices running Android 1.5 or greater, and has been evaluated on the HTC Hero (1.5), G1, Droid, and Nexus One (as far as I know; it may have been tested on other devices as well). - some international versions of the Motorola Milestone (German, Italian, Argentinian, multiple reports) although barcode scanning and Quick Add to Calendar should still be functional on thsese devices. Bottom line: if your phone can't do Googe Voice Search or Voice Command, then it won't be able to use any of the voice-to-text tools out there. INSTALLATION INSTRUCTIONS: To install the widget, please make sure you have a 1x1 or 2x2 area free on your home screen (it can be any one of the home screens, but you must be on the screen that has the free space). In the free area of your home screen, press and hold a finger to the screen until the device buzzes. When you let go, a menu should come up with several options. Choose "Widgets". Scroll down to QwikList 1x1 or QwikList 2x2, depending on the size you want, and select it. Voila! It will appear on your screen. If you already own the app and need to update the widget to the new layout, press and hold the current widget and drag it to the trash can at the bottom of the screen. Then follow the instructions above to reinstall the widget. This process will not affect your stored data. * As above for the functions of each icon and area on the 2x2 widget. * Only opening the app and recording are supported in the 1x1 app. - Press and hold on the desired list inside the app. Select "Make primary". - Pressing and holding an item in the items screen and select "Share"
* Calendar quick add prompts you for your Google username and password. This information is used entirely to negotiate with Google's servers. In addition, should you choose to store the ID and password, the password is stored on the phone in an encrypted form. ATTENTION NEXUS ONE USERS: The applications passes the functionality checks that are possible to make while working in the emulator. I have reports that it is functioning on a live Nexus One as well, but that the app required a reboot of the phone following installation to get normal/expected behavior. It is not clear to me whether this is the fault of my application or of Android 2.1, but if you buy it, please restart the phone after installing the app and opening the widget onto your home screen. APP NOTES: I would *love* to be able to handle flicks/scroll the list/sync with Google Tasks (the last in particular is something I think would provide immensely useful functionality). However, all of these limitations are outside of my control. As far as the flicks/scrolling goes, Android provides extremely limited manipulation capability to developers for home screen app widgets. This is in an effort, rightly so, to prevent catastrophic failures where even the home screen doesn't load because of a rogue widget. But it also keeps developers from handling gestures or adding things like text entry fields or scrollable lists. And for Google Tasks, Google has not yet released the "API" (methods for interacting with that data). I included the launcher into Google Tasks as a helpful shortcut, but I cannot provide sync functionality yet. A NOTE ABOUT THE VOICE RECOGNIZER: Unfortunately, there is no way to alter the speech recognition. It is a built in part of the OS and acts essentially as a black box, where the developer tells the speech recognizer to start up and waits on it to finish for a result. The engine requires a connection to the internet and so will fail if you have no wifi and are out of range. Since Google handles all of the voice-to-text functionality, I have no way of altering it for improved recognition or longer times. It doesn't even come close when I say my name! But I've found that if I speak slowly, separating out each word and enunciating the syllables, and there is not a lot of ambient noise around, the recognizer picks up about 80-90% of what I'm saying. That's why I added the "confirm" popup as part of the preferences (which was a suggestion by a user) - because sometimes the voice translator comes back with some pretty hilarious stuff. Support development of the app! I put the app on the Market for 0.99 because I think it is a useful app and didn't want people to hesitate to try it out. However, I put a lot of work into development of the app (see below for revision log). If you like the app and wish to contribute an additional donation for continued development, you can do so by clicking here - you get to choose how much - or you can click on one of the ads to the right. QwikSMS AutoResponder: Sets up automatic responses to SMS / text messages. You can set whether to respond to all incoming messages or just those from known contacts. Push the blue man icon to set the response message by voice. The app is free - I think it is a useful app. However, I put a lot of work into development of the app. If you like the app and wish to contribute to continued development of this and other apps, you can do so by clicking here - you get to choose how much - or you can click on one of the ads to the right.